Hope you are all doing great and learning various financial aspects along with me. In the last article, I planted the seed for becoming Rich by Systematic Investment. Hope you read the same. The attitude and mindset is extremely important if you want to become rich and create wealth. If you have not read that, Click here to read !!! Today, I am going to cover a very basic, fundamental and important concept. We have heard this word multiple times - Compounding. People talk about the Power of Compounding and its enormous potential. But what exactly is Compounding? How does Compounding work? Is Compounding really advantageous? If yes, how does it make THE DIFFERENCE? Back in the old, golden school days, we were introduced to the concept of Interest in Mathematics. Interest is a predefined percentage of our Principal which is given back to us along with Principal when we keep our money in a Financial Instrument for a specified amount of time. When we park our money in a Bank, we will get some interest for our Principal amount. Let us try to understand Simple Interest first. Keep a notebook & pen ready to follow the calculations. A calculator will also be handy. Let's say that, on the first of every month, we deposit Rs 1000 in a Savings Bank account. We continue to deposit this monthly amount for a period of 120 months (10 years). Let us consider that the Bank provides us 8% Annual simple interest for the amount. So, now, let us see what happens to our money. As you can see, in this case, the Total Interest is added to the Final Principal amount. 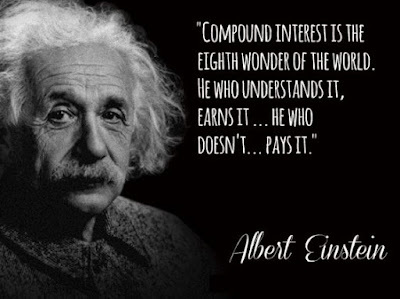 Compounding is the process of getting Interest on Interest. In Compounding, your Interest gets added to the Principal (either Monthly, Quarterly, Half Yearly or Yearly) and the next Interest is calculated based on the Principal + Accumulated Interest. Confused?? Let's take the same example as an approach. Let's say that, on the first of every month, we deposit Rs 1000 in a Compounding account (Recurring Deposit). We continue to deposit this monthly amount for a period of 120 months (10 years). Let us consider that the Bank provides us 8% Annual Interest for the amount. Let us assume that Interest is Compounded Monthly. So, now, let us see what happens to our money. As you can clearly see, the Amount we get by Monthly Compounding is greater than the Amount we receive after Quarterly Compounding. 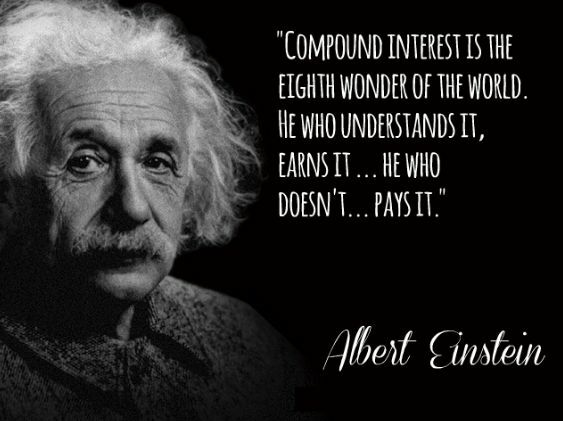 But Compounding fetches far greater returns than just Simple Interest. In this case, as the name clearly suggests, Interests are added every 6 months and added to the Principal. In this case, as the name clearly suggests, Interests are added every 12 months and added to the Principal. As the periodicity of compounding decreases (Monthly -> Yearly), the returns also decrease appropriately. 1) Systematic investment - A certain amount needs to be invested periodically, preferably every month in a Compounding plan (Recurring Deposit, Mutual Funds or Equity) without fail. Of course, RD (Recurring Deposit) is the safest since the Principal is guaranteed. But, the Rate of Compound Interest provided by Banks for RD will be very less. Hence, people try to invest in Mutual Funds or Equity in solid companies which can provide a better Compounding Interest over long term. If the bright company manages to grow at a rate of above 15% every year, the money gets compounded at the same pace. 2) Start early - Saving is a habit which needs to be cultivated at an early stage of life. A person who invests Rs 1000 in a RD with 8% Compound Interest for a period of 30 years will get Rs 1484262 on Maturity. The earlier you start the better. 3) Stay invested for a longer period of time - Compounding works only as the Principal + Accumulated Interest grows. The longer you are in the plan, the Interest starts working for you. The real power of Compounding can be seen when we continue this discipline for decades. You can retire rich. 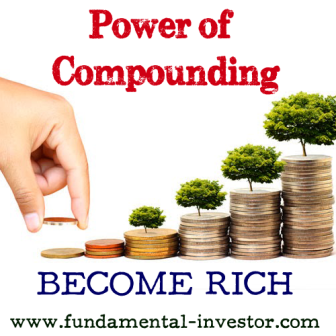 So, with discipline, homework and long term vision, enormous wealth can be created with the amazing power of compounding. Its no wonder that the investors who created enormous wealth, are those, who stayed invested for a long long time. Tap the Power of Compounding.. Don't underestimate its Wealth Creating Ability. - I have tried to explain this concept in a simple layman term. Try to understand the fundamentals and then explore on your own. - If there are any doubts or suggestions, please feel free to email me so that I can add/correct my thoughts. After all, we are all learning. Well elaborated example. Thanks for the efforts put in . Look for similar example for stock picking .